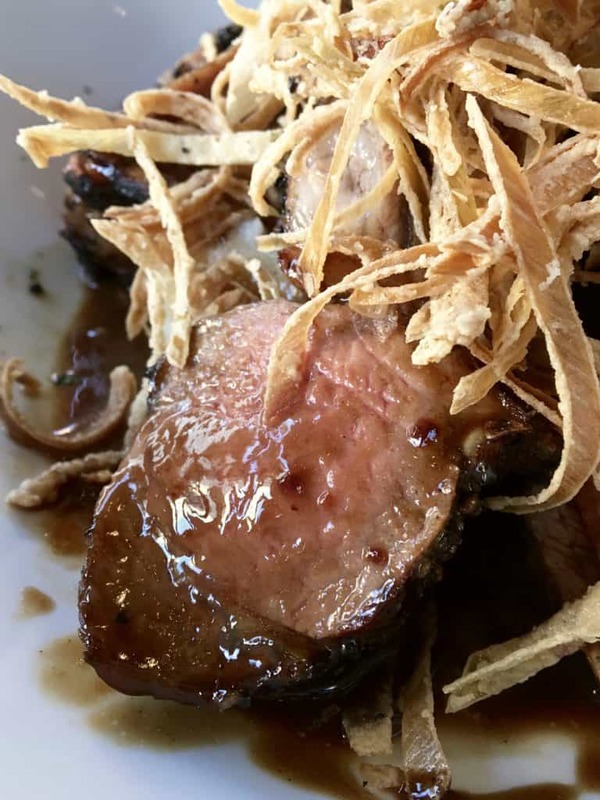 Fleming’s Prime Steakhouse is a great place for so much more than steak. Their wine bar is reason enough to visit, but you’ll go back because of the service. You know I’ve talked about Fleming’s Prime Steakhouse & Wine Bars before, and even offered a $100 gift card in the past. Well, it may feel like déjà vu, but I’m giving one lucky reader yet another Fleming’s gift card this weekend! GIVEAWAY HAS ENDED. 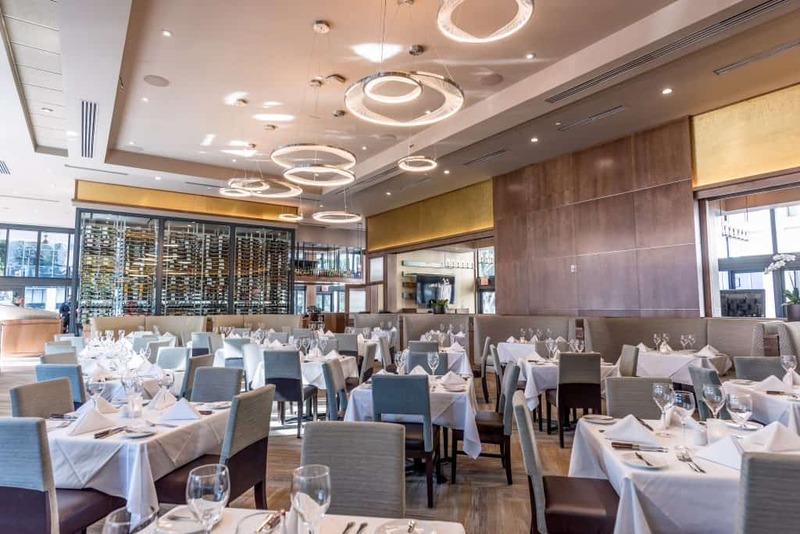 Disclosure: Fleming’s Prime Steakhouse & Wine Bar hosted me and a friend for dinner, and gave me a $100 which I have chosen to give away to a lucky reader. I was not paid and all opinions are my own. 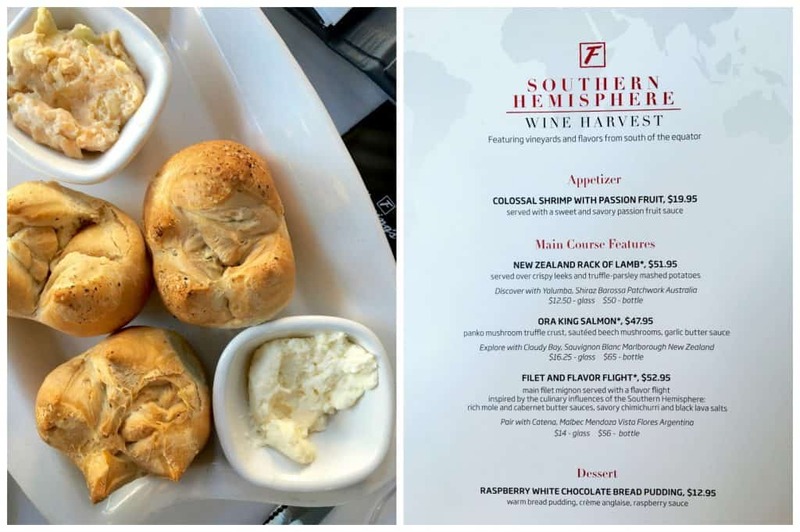 Until May 1st, Fleming’s Prime Steakhouse & Wine Bars are celebrating the Southern Hemisphere’s wine harvest with a special menu, and I’m so happy I was able to sample it! I went with my friend, Maria (who you may remember from my Catalina Island trip), and enjoyed a lovely relaxed evening at the Fleming’s Pasadena location. Phil was our friendly and attentive waiter, and throughout the night, the service he provided, as well as others, was spot on. I can easily say that Fleming’s is fabulous on providing consistently great service. 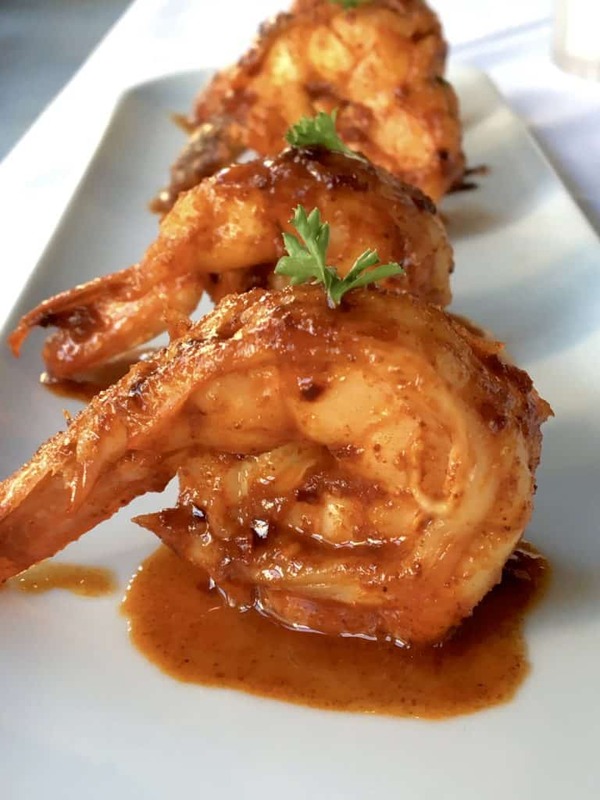 We started with the Colossal Shrimp Appetizer with Passion Fruit Sauce, which we both enjoyed. The flavor of paprika came through more than the passion fruit, however, it was still a lovely starter. Maria and I both loved the presentation, too. As you can see on the menu, each main course features a suggested pairing with a Southern Hemisphere wine. I ordered the New Zealand rack of lamb and was excited to see a Barossa Valley Shiraz as the pairing. I’ve done some reading and research on this wine region of Australia and it is very high on my travel bucket list! 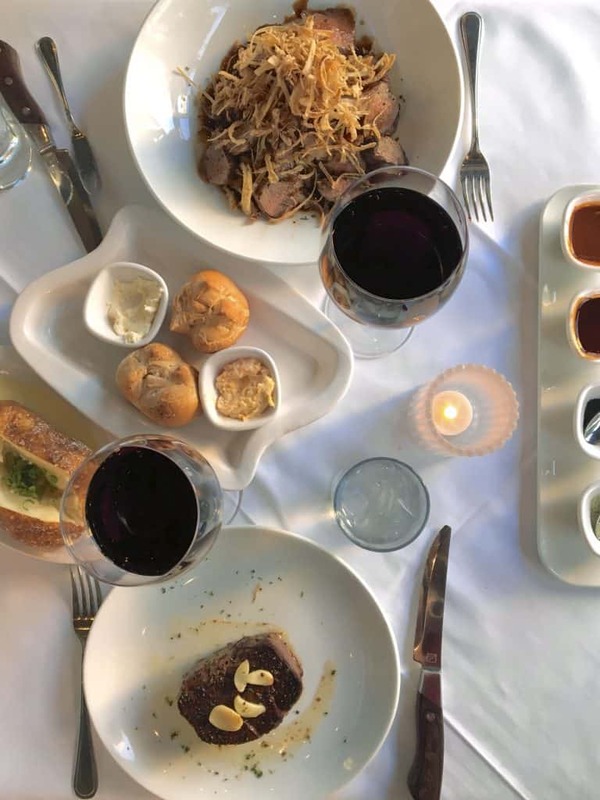 Maria ordered the Filet and Flavor Flight, which was paired with an Argentinian Malbec. I’m just going to warn you before these upcoming photos: do not proceed whilst hungry! New Zealand rack of lamb served with crispy leeks and truffle parsley mashed potatoes. Both Maria and I were so happy with our choices. I can easily say that this lamb dish was the best thing I’ve tried at Fleming’s Prime Steakhouse. It was perfectly cooked to my liking and the flavor was fantastic, with absolutely no “gamey” lamb taste at all. I do believe when people say they don’t like lamb, it’s because it doesn’t taste like this sort of perfectly prepared lamb. I really enjoyed the creamy, mashed potatoes, but one of my favorite parts of this dish was definitely the crispy leeks! Goodness, I don’t think I left one on my plate (although, I did have to take some lamb home as it was a very generous serving). Maria went to town with her garlic-topped steak and just had so much fun tasting it with the four flavors curated from Southern Hemisphere influences. There was a rich mole (which Maria loved), cabernet butter sauce (my favorite), savory chimichurri and black lava salts. My Barossa valley Yalumba “King of Shiraz” was a huge hit with both Maria and me! I loved its fruitiness and I could easily have this wine on a regular basis. Maria and I also agreed on her Catena Malbec: not our favorite choice. However, I tasted it after really enjoying my shiraz, which almost seems unfair, given how much I liked the Yalumba. The salmon on the special menu is paired with a Sauvignon Blanc from New Zealand, as well as Fleming’s everyday menu. In case you didn’t know, it includes 100 wines by the glass. 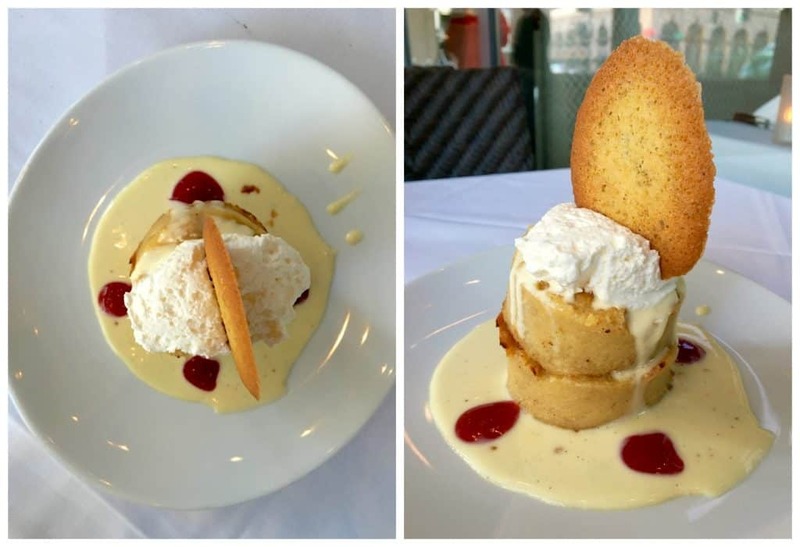 We simply couldn’t manage two desserts, so the Raspberry White Chocolate Bread Pudding from the Southern Hemisphere menu was chosen. As much as we both loved the combination of the delicious crème anglaise and tart raspberry sauce, and its pretty presentation, I can’t actually recommend the bread pudding. It was simply too heavy for me, especially after the lamb. 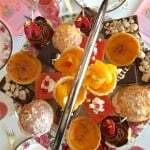 I would suggest staying with the desserts from the standard menu. ~What would you order from Fleming’s Southern Hemisphere Wine Harvest special menu? After your review, my choice has to be the Shrimp and Sea Scallops! 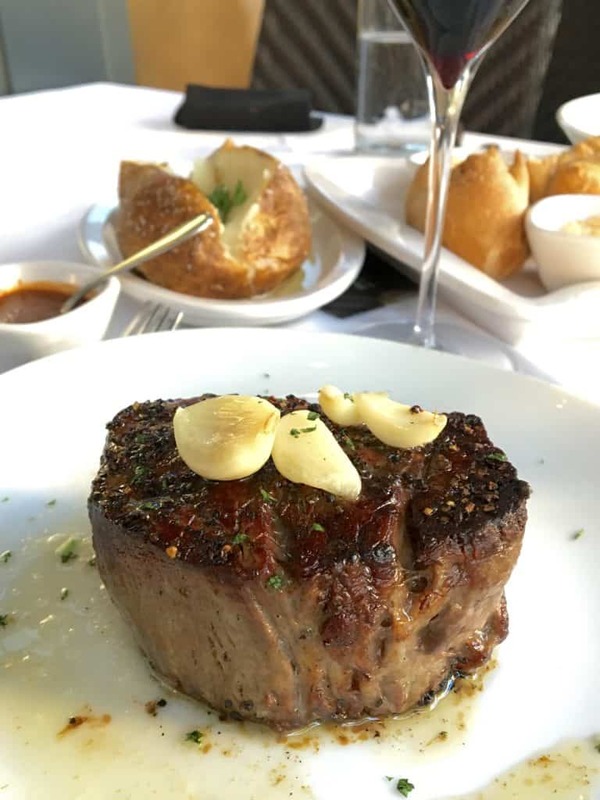 I would absolutely order a medium rare filet with a lovely Malbec…Fleming’s steaks are always fantastic! I would order the filet! We don’t have Fleming’s here. However I totally nominate my friend Kari & her husband. Simply because they’re the bees knees and ❤ great food and drink. ☺ Fleming’s looks like they have both! And if we did have a Fleming’s I wouldbe all about the bread pudding and the steak. That’s awesome, Laurie! And you never know, if you’re traveling there might be a Fleming’s where you go! Good luck! The filet sounds amazing. Would love a date night with the hubby. Good luck to you, Taylor! I would try the lamb – it is so good when done well, and this looks fabulous. I loved it, Tina! Good luck! I will order the New Zealand rack of lamb. We almost never cook steak at home and like to go out to a good steakhouse for a treat. I’ve never tried Flemings! I’m currently on an Atkins diet so I’d love a nicely prepared steak with double veggies on the side! Definitely a good idea, Andi! Good luck! Everything looks so good! I can not decide! Well, if you win, you’ll have to decide! Good luck! I would get some jumbo shrimp or a beautiful piece of salmon. I’m a sucker for Bread Pudding soooooo, yeah, I would zero in on that. Yummy!! FYI, you might want to read my post first. Good luck in the giveaway, Bonnie! I would get the New Zealand rack of lamb. Yum! Good choice! Best of luck, Rachel! I would get the New Zealand rack of lamb served with crispy leeks and truffle parsley mashed potatoes and the .Raspberry White Chocolate Bread Pudding for desert. You’ll see I LOVED the lamb, but be sure to read my entire review, Susan. Good luck on the giveaway! The leg of lamb, with all the different sauces, yummo! The sauces come with the steak, so you’ll have some decisions to make! haha! Good luck, Jeccica! I’m obsessed with bread pudding. Is my absolute favorite dessert so I definitely would try. The picture you took looks amazing. Oh my goodness, it would be so hard to chose between a good old steak and the lamb … both are “happy” foods, in my opinion…. and how convenient that we have a Flemings in Walnut Creek?! I’m not usually a big steak person, but I can tell just from your photo that that steak is delicious. I would definitely have that with the Shiraz. I love Shiraz but don’t drink it very often. I would get the double thick pork chop! I would definitely have the lamb since it’s a favorite of mine. There’s a Flemings not to far from me in Chandler, Az. Would love to try it sometime. Awesome! Best of luck to you, Vicky! Oh my goodness, all of that looks so good! I still have yet to ever try Fleming’s! I would definitely order the Ora King Salmon with panic mushroom truffle crust, sautéed beech mushrooms and garlic butter. Of course a side of Sauvignon Blanc! Perfect, you don’t even need a menu when you arrive! :) Best of luck, Starla! I would have to get the steak.. I mean come on! it looks amazing. I would definitely order a filet mignon with black and white peppercorns – my all time favorite steak! Although that’s not on the special menu. 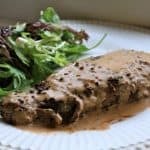 I must admit, I do love steak au poivre myself! No brainer for me I would try he leg o lamb! So good!! Lot of luck! Everything looks so delicious, but that filet looks like it would melt in your mouth! It would be a such a treat and they are just a couple of miles away! Thanks Christina! Great, Carol! Best of luck to you! I would order the Colossal Shrimp with passion fruit! I love shrimp! 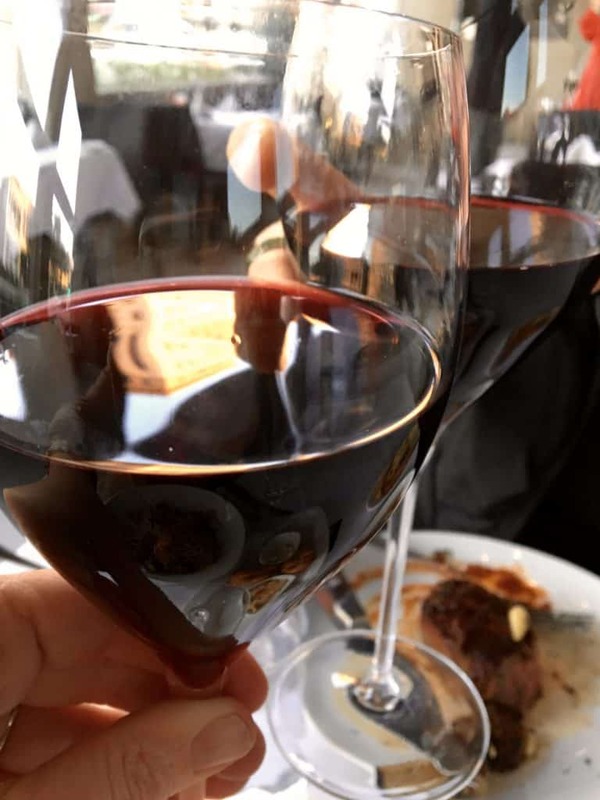 I would love to try to the Yalumba Shiraz with a Filet Mignon and truffle poached lobster with béarnaise sauce and caviar! I would love to try that dessert! I would order the Ora King Salmon! I would order the Shrimp and Sea Scallops. Everything looks so yummy it would be a tough choice. Probably the lamb or the steak or the? How about taste of each! Decisions, decisions. Probably the lamb. I’ve had crispy shallots before and they were the most addictive thing! Now I’m dying to taste those crispy leeks. Aren’t they? Best of luck to you! This looks amazing Christina. I love lamb, and crispy leeks? I’m so in on that. My dad has a Fleming’s near him so I’d love to take him as he also loves great food and wine! We’ll have to go soon and check out this fab food and wine pairing. Awesome, Kelly! Good luck to you, too! A filet for sure! We enjoy Fleming’s every now and then. The food is quite rich! New Zealand rack of lamb. My fav! Best of luck, Christopher! I absolutely adore lamb – I could bring my own mint sauce (just joking, I wouldn’t dare insult the chef that way!) And that gratin!!! Oh my. 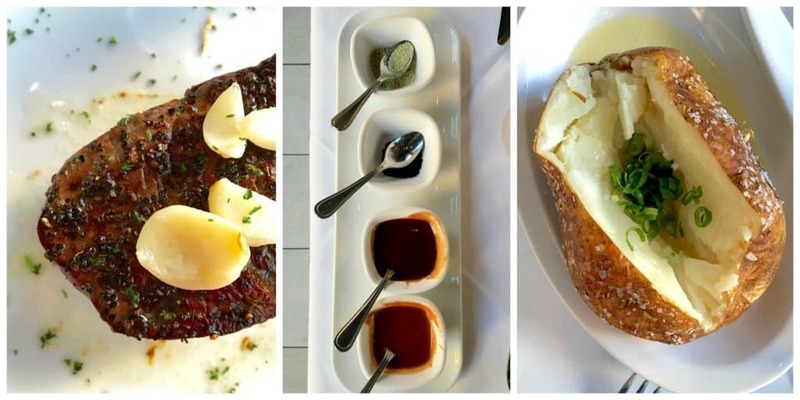 It all looks just so delicious I think I would be sitting there for an hour while the poor server kept saying “Have you chosen yet Ma’am?” Husband would be getting irritated, knowing exactly what he wanted – STEAK – STEAK – STEAK!!!!! Oh well, we all can dream, whoever wins, I hope you have a wonderful meal …. what do I mean “hope”. 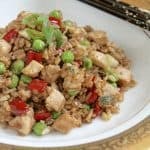 I know you will have a wonderful meal! Haha! That’s lovely, Lee! Good luck to you! Did your husband enter, too? Why not? Rack of lamb, that looks amazing and NZ lamb is the best! It’s SOOO good, Kirsty! Wishing you the best of luck! After your review, my choice has to be the rack of lamb! Good choice and good luck! That rack of lamb looks absolutely fantastic! And can’t go wrong with a good Shiraz pairing. Agreed on both points! Lots of luck, Sophia! Roz here from La Bella Vita Cucina. Hope you’re doing great this wonderful and beautiful spring day! My husband and I have dined at Fleming’s in Des Moines, Iowa where my immediate family lives. We were highly disappointed in their steaks. We truly do believe that service marketers sometimes ‘miss’ out on quality due to the quality factor in ‘human’ preparation’ and ‘presentation (sorry, but I’m still a marketing professor that watches for these attributes). I would like to throw our name(s) in this giveaway and (hopefully) prove our previous negative experiences at the West Des Moines, Iowa Flemings as incorrect for (several, an not one evenings of dining). SO WHAT WOULD WE LIKE TO TRY (per your question for the giveaway)? I’d love to try to give Fleming’s a go at their Lamb as you have presented here; however, I know that my husband would be interested in a high quality and delicious FILET MIGNON. 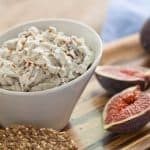 I would LOVE to write a positive, extraordianarliy POSITIVE commentary on our “Flemings of West Des Moines, Iowa” experience of ‘GLOBAL FOODIES”, but is totally dependent on the deliverables of Flemings in West Des Moines, Iowa where we visit several times every year to see family. Thank you for entering our name in this generous giveaway! And keep up the great work with your extraordinary Italian food blog that I appreciate so much! Without a doubt it would have to be the lamb. Not a regret to be had! :) Good luck, Christine! I love their gratin. I make a version that s close…. Goodness, I do too (love their gratin)! Best of luck for the giveaway, Jerry! I’ve only been to Flemings once, but it was great! I would get the filet mignon or rack of lamb. Good luck to you, Monica! OhmyGosh that Rack of Lamb!! I know! And it tasted better than it looked! Good luck, Julie! Got so excited I forgot to write what I would get! It would be the Filet and Flavor Flight from Fleming’s with a LOADED baked potato! Definitely the filet! It all looks amazing! Great! Best of luck to you, Suzanne! Rack of lamb, Yabba, Dabba Dooooooo! C’est la vie! First choice seemed to be the Filet and Flavor Flight, since Fleming’s is a Steakhouse. However after drooling over your description of the New Zealand rack of Lamb – that might win me over!! Would lobe the certificate to give either a try. Absolutely can’t go wrong, Judy! Good luck! Definitely the lamb but all sounds amazing! about to sit down for dinner at Flemings? Oh dear, I did warn you! ;) Best of luck to you, Nancy!! I would order the New Zealand Rack of Lamb! I would order it again in a minute!! Good luck, Aaron! 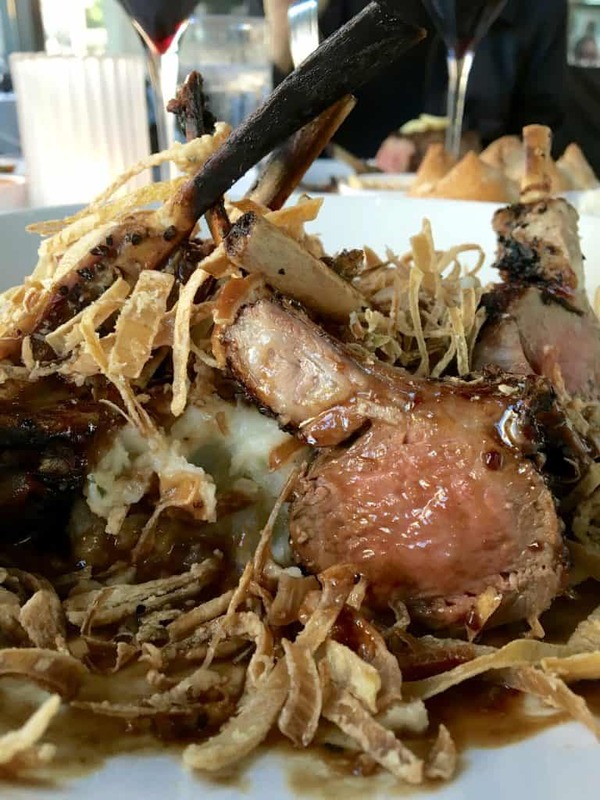 Definitely the rack of lamb….it is my birthday dinner every year at our Chicago Greek Islands restaurant. I have had Fleming’s steak at my son’s wedding dinner at the Destin, Florida location….the service and food were outstanding!!! That’s fantastic, Alexis! Best of luck! I’d love to try the New Zealand rack of lamb. It was awesome! Good luck, Annette! I love Flemings! It looks like you had another fabulous meal. I’ve never had the lamb there, but it’s my favorite meat! Good luck to one lucky winner! Next time you’re there, give it a try, Cynthia! The fillet would be a top choice! Good one, Jennie! Lots of luck to you! But of course! :) Best of luck, Carole! I’m heading to Vegas this August and I see they have a spot there. Fingers are crossed! I’ve never been before. Lots of luck, Murissa! I’m sure their Vegas restaurant would be awesome! It’s a wonderful meal, Elena! Good luck! I have been dying to go to Flemings! Their ads look soo good! I’m a steak lover so this has been on my date night bucketlist for quite some time. This is a steak lover’s restaurant, for sure! Good luck to you, Kristie!